After a week of listens my least favorites are Lame Claim To Fame (but the video is outstanding) and Jackson Park Express because it's 9 minutes long and no part of it is catchy. Guys, the concert-exclusive verse of My Own Eyes just leaked! What do you think? It doesn't matter if I do things for a reason, or on a W-H-I-M... Just stand back and enjoy the show, cuz baby, I perform this way! PlayAWarGame wrote: Guys, the concert-exclusive verse of My Own Eyes just leaked! What do you think? So I guess the lesson here is, what? ... I can write comedy but I can't read it? Talk about killing my own argument. Oh well, maybe with some luck I'm still welcome at the Star Trek convention. It's 'Mission Statement' for me. I understand the humor of the song, but as a listening experience, it just doesn't grab me. It meanders too much through the lyrics. Like John Cage's 4'33", I respect the intent, but that doesn't mean I'm going to sit through it every time. It's not an 'skip-it-nearly-every-time' like 'Airline Amy,' but it is my least favorite. 'Handy' would be second. weird_el wrote: After a week of listens my least favorites are Lame Claim To Fame (but the video is outstanding) and Jackson Park Express because it's 9 minutes long and no part of it is catchy. Not even "Ooh, mama! What is that deodorant your wearing? It's intoxicating..."? Part of me wished more parts of Jackson Express were like that. 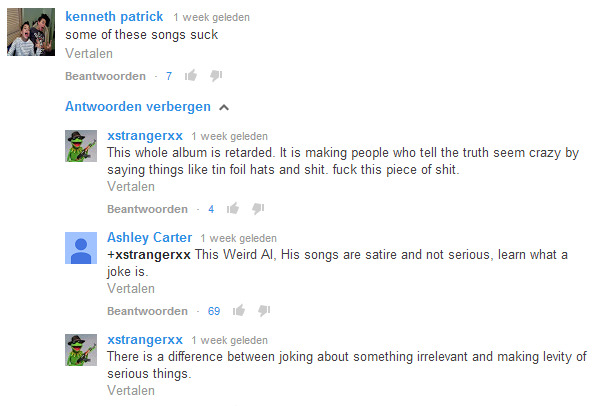 Some people say I'm the one who got Al to be in an Epic Rap Battles of History. that's a good point about JPE not being catchy. I think that's what contributes to me not being able to fall in love with it. musically it's just not that interesting of a song. Man, some people just can't take a joke, y'know? Last edited by Marc on Tue Jul 29, 2014 9:10 pm, edited 3 times in total. And here I thought people were only throwing a fit about "Word Crimes." I actually kind of wondered if someone would bring up the inhaler line in "Inactive" as being "insensitive". 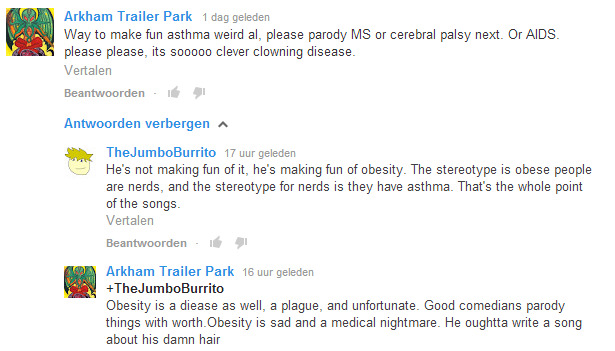 People were already whining about "Word Crimes" being "bullying", so was surprised the asthma thing didn't come up. Maybe because it's one of the lesser songs on the album. As someone already wondered in a different thread, I wonder if Al could even get away with releasing "Fat" these days without being called a bully.